I haven’t used amazon and its services much, but to be honest, they’re quite confusing! Recently I was “required” to enter my amazon accounts Access key ID and Secret Access Key and was not able to find it very smoothly! 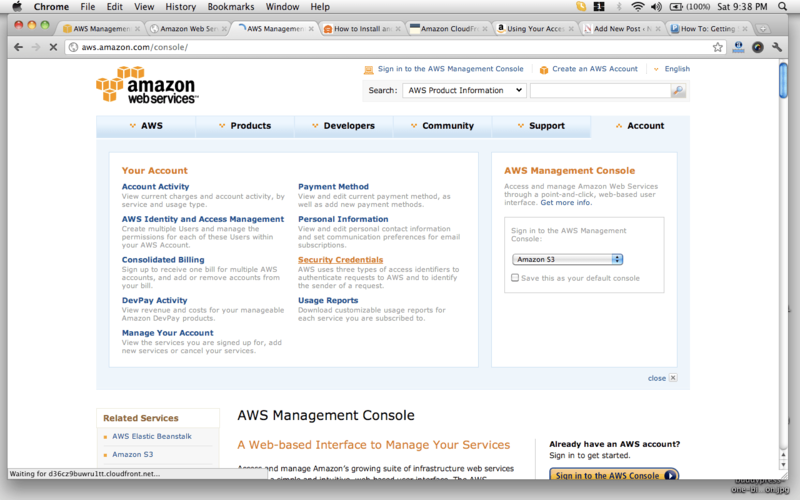 I needed them to setup cdn on w3total cache with wordpress – for using amazon cloudfront / amazon s3 as cdn. So where can you find amazon aws access key id and secret access key? It’s not that hard too either! Note: these steps are for amazon cloud front / amazon s3 specifically. 2. click on “Account” link from top menu to see the account slide with various options and links. 6. If you don’t have any Access Key yet, click “create new” to create an access key ID and secret access key. Let me know if you have any queries or difficulty while following these steps!